ERIC WAHL is the answer to The Minimum Requirements' percussive question. 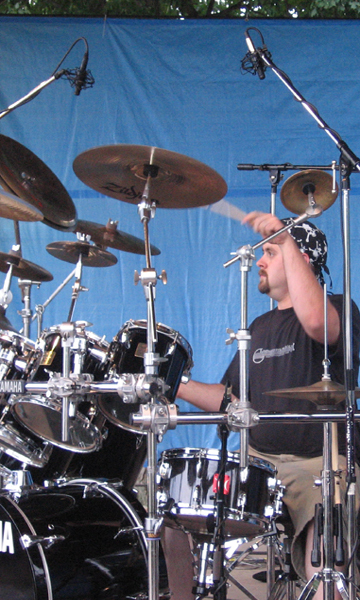 He plays drums, auxiliary percussion, and the occasional acoustic guitar in both the studio and the band's live show. Eric was born in 1980 in Manhattan, NY where his parents were deeply involved with theatre, on and off Broadway. Unable, most of the time, to find a babysitter for Eric, his parents would take him along on the theatrical road show. It was around this time that he received the coveted Fisher-Price snare drum and would make his presence known to the world. In 1982, Eric's family moved to Clifton, NJ. When Eric was old enough, he was enrolled in grade school, and while there, met music instructor, Mr. Franchino. Eric recalled an assembly where he saw a fifth grader wail a Stevie Wonder hit, "I Just Called to Say 'I Love You'" on the saxophone. When Mr. Franchino asked the third grade class if anybody was interested in the music program, Eric's hand immediately shot upward. Later that evening, while looking over the signup sheet to be involved in the music program the following year, Eric was left with the choice of what instrument he was most interested in playing. Remembering the fifth-grader's performance at the assembly, he jotted down "sax or drums". Lucky for him, the band was in dire need of another drummer. Thus began the long, hard road of the soon-to-be TMR drummer. When Eric graduated to middle school he already had an unhealthy fondness for Beach Boys music, having sung along to the incredible harmonies while on the road with his parents. But it was in middle school that he was introduced to mainstream pop music, M.C. Hammer, Nirvana, and the rest of the grunge genre. It was in these couple of years that his parents bought him his first drum set. He continued with the school band and even joined their jazz band. However, as fate would have it, Eric would move again, negating his chance to ever play with that jazz band. In 1992, Eric's family moved to North Olmsted, OH. Eric was enrolled in the North Olmsted Middle School, and joined the ranks of the drum section in Bud Malchus's concert band. After graduating to High School, Eric was left with another decision: Soccer or Marching Band? Students had juggled both, but not very well. His devotion to music was clear, and Eric opted to join the drumline. In High School, Eric was approached by Chris Venesile and asked to play drums for the vocal jazz ensemble, Special Edition. Two other musicians would round out the rhythm section in that band; Jonn Sokol, who Eric knew from marching band, and Chris Nunnari. All three of the musicians played in a fusion band called Sarcasm Included. After Special Edition played a few concerts, Chris Venesile decided he wanted some auxiliary percussion in the mix. He called upon Danny O'Brien, who he knew from the High School's production of The Sound of Music. Enjoying the newer rhythmic direction, Jonn and Eric asked Danny if he would be interested in joining Sarcasm Included. Indeed, he was. Sarcasm Included played one final show after Danny came onboard, then disbanded. Not wanting to give up on music, Danny and Eric entertained the idea of starting another band. Although initially skeptical about Danny's ability to play guitar, having never heard him play, Eric was pleasantly surprised at Danny's musical ability. With the addition of bassist Justus Brake, whom Danny knew from their previous band, Feelin' Fine, The Minimum Requirements were born. Eric has an Associate of Applied Science degree in Audio Engineering, and enjoys recording local bands as well as current and future TMR releases. When not playing with TMR, Eric flies over the cityscape of Cleveland looking for superheroes with whom to do battle.